Third party-owned (TPO) financing options (including leases) were responsible for igniting the home solar boom, and TPO financing dominated the market until relatively recently. Despite the growth of customer-owned financing, leases remain the most appealing financing choice for certain customer types. As new leasing programs and better software make selling leases easier and more accessible, more solar companies can add leases to their financing mix and start closing more customers. Who should finance solar with a lease? As a solar installer, you know that understanding your customer’s needs and tailoring a custom solution is the key to closing deals. And as discussed in our recent webinar, being able to help prospects navigate different financing options based on their specific situation can be a major competitive advantage. So, what are the telltale signs that a homeowner might be a good candidate for a solar lease? One of the main advantages of going solar with a loan is the ability to claim the federal tax credit. However, many homeowners may lack sufficient taxable income to fully utilize the credit – for instance, retirees on a fixed income, or self-employed freelancers that write off lots of expenses. Leases make much more financial sense for these prospects, as solar savings will be significantly higher with a lease than with a customer-owned financing option. Going solar is a major investment, and many homeowners want to keep it as low-maintenance as possible. Solar leases fit this profile, as they typically come with performance monitoring and maintenance included. Relative to customer-owned financing, lease financing enables a “set it and forget it” sale, which aligns with most homeowners’ desire to save money without having to become a solar expert. For a variety of reasons, many homeowners don’t want to add debt to their credit profile – or a lien to their property, in the case of PACE loan financing. In this case, leases are the best financing option, enabling customers to keep a clean credit profile and unencumbered property. In broad demographic terms, these factors suggest that leases may appeal most to homeowners at the younger as well as older end of the spectrum – for instance, a young, self-employed couple that have just bought their first home, or an elderly couple on a pension looking to keep their electricity bills low. That being said, every homeowner wants going solar to be simple. You’ll close more sales if financing, which is often the most complex aspect of the solar sale, is easy to understand. Almost every prospect will be familiar with the concept of a lease (reference leasing a car) and most prospects aren’t interested in getting on the roof to maintain their solar system, so leading with a lease and pitching simplicity and convenience, irrespective of the homeowner’s specific situation, can be a strategy that results in more sales. 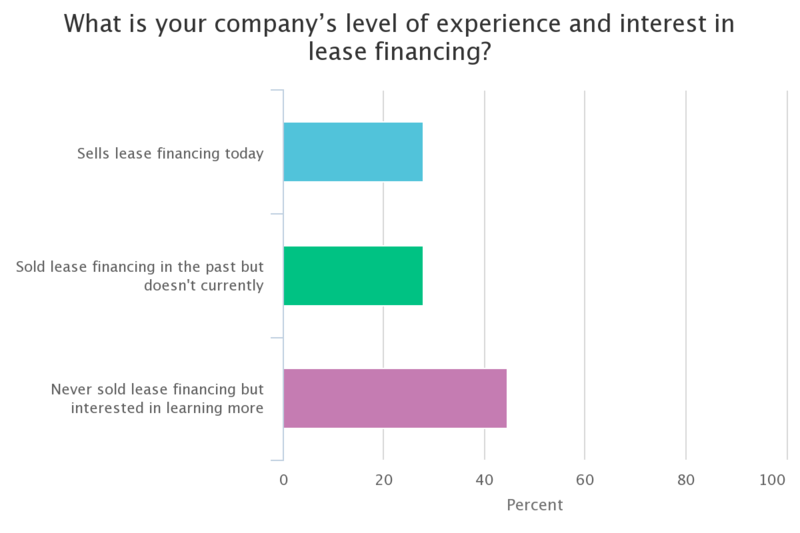 Lease financing dominated in the early days of residential solar in part because of these factors – but mostly because it was basically the only form of financing available. The nature of lease financing and the financial engineering involved meant that only the largest solar companies could efficiently offer leases, giving them a huge advantage in the market and driving rapid growth for these national players at the expense of other installers. However, as new solar financing types have come online and new financing providers have entered the market, financing has become much more accessible to installers of all sizes. This has leveled the playing field and shifted growth away from the very large installers that dominated the early residential solar market. Going forward, growth is expected to be increasingly driven by small and medium-sized solar installers. These companies are more nimble, more connected to their local market, and more empowered than ever to compete thanks to a wide range of financing programs and software tools. Until recently, leases were not part of the “expanded access to financing” story, as lease financing continued to be dominated by a small number of incumbents with strict program requirements. But new lease programs are now coming online with installer-friendly financing products and program requirements, finally making lease financing flexible and accessible by installers large and small. Leveraging good solar software with sophisticated financing capabilities makes getting going with a lease program easy and fast, allowing installers to start winning the types of customer-specific scenarios described above in a matter of weeks. Sighten’s mission is to provide our customers with the tools they need to be as successful as possible in the solar market. Sighten users have consistently told us that great solar software is incredibly helpful, but that great solar software combined with financing is truly a game changer. That’s why we’ve partnered with Lifestyle Energy to provide their lease products directly to installers through our industry-leading solar software platform. Lifestyle’s program offers great pricing with no dealer fees, a seamless process, and comprehensive customer support. And by integrating the entire Lifestyle lease process, from lead to PTO, within Sighten’s software platform, you can easily sell these products as part of your existing workflow. Click here to learn more about the Lifestyle Energy lease program and how you can quickly and easily add leases to your financing repertoire. And stay tuned for more exciting updates as we continue to roll out new programs over the coming months!